I am very fortunate to live and work surrounded by gardens. Even in winter, nature is part of my everyday life. But not everyone is so lucky. Some of us have friends and family members working in city high rises, crowded into sterile offices or lifeless cubicles. As gardeners, I’d like to think that we can alter this situation, especially around the holidays, by bringing a little bit of nature into these people’s lives. 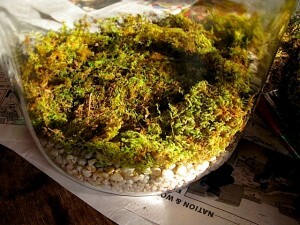 A few years back a friend of mine gave a magical, mist-covered terrarium as a birthday gift to a mutual acquaintance. This gorgeous garden-behind-glass, filled with ferns and moss, inspired me to create one for a nature-lover I know; one sadly trapped inside a concrete jungle. I have loved building mini-greenhouses ever since grade school, when they were a big fad with my friends. Although terrariums disappeared for awhile, I am happy to report that this indoor gardening trend has returned – and with a vengeance ! Terrariums are all the rage right now. 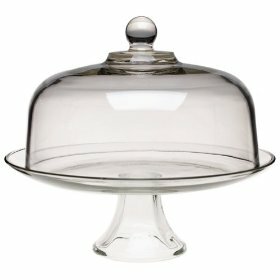 The popular craft and decorating blog Design * Sponge has been running spots on glass covered terrarium ornaments and even haunted ‘terror-ariums’ for months, and suddenly it seems that tiny greenhouses are turning up everywhere from trendy restaurants and hotel lobbies to libraries and classrooms. 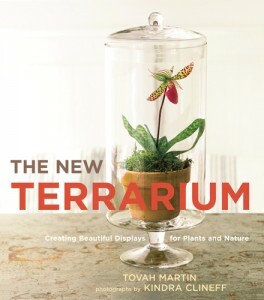 With the surge in terrarium popularity, you might think that keeping plants beneath glass is a new idea. But small-scale, glass covered gardens have gone in and out of fashion for centuries. The Victorians were particularly elaborate, designing exquisite table-top greenhouses and free-standing conservatories in miniature, (usually fashioned from plate glass and forged iron). These days, we are seeing everything from itty-bitty, hanging glass-globe-gardens to enormous, sculptural terrariums; masterful works of art and horticultural science. 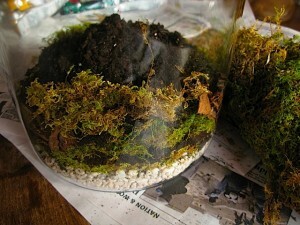 To build a simple terrarium like the one I made, (pictured at the top of this article), begin by locating a clear glass container with a lid. 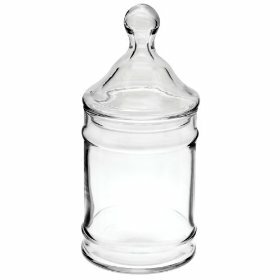 The smaller one pictured here is an Anchor Hocking 3 quart, glass kitchen canister. You can find these at most department and craft store, or order them through the various links below. 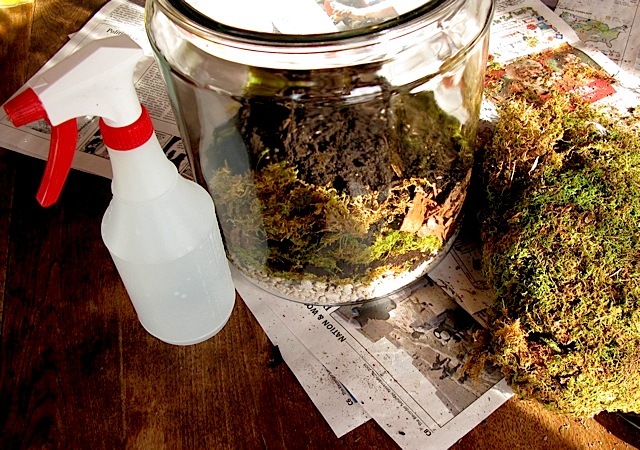 If you are planting your first terrarium, or if you are working with school-aged children, I recommend starting with simple containers or jars. 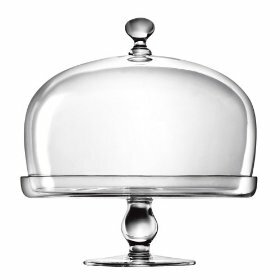 If you are making a holiday gift, or feeling more adventurous, then by all means get more creative with antique apothecary jars, glass cake domes, or specialty terrarium containers. 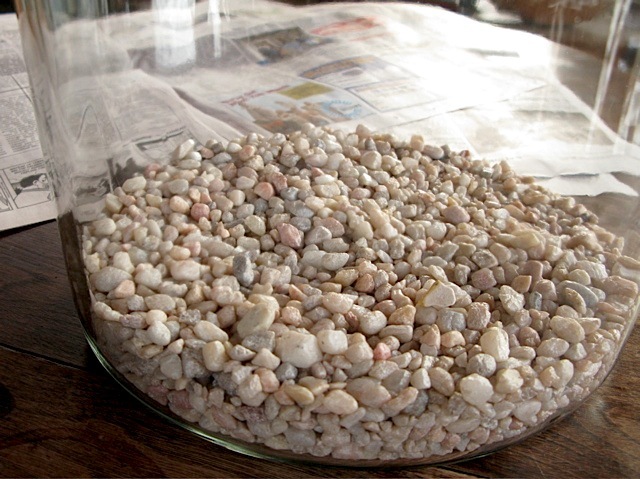 Step one: Purchase pea gravel or aquarium stone, sphagnum moss, (for native plants I also recommend peat moss), and good, dry potting soil, (you can get all of these things at a local home store like Home Depot). Collect decorative materials such as stones, bark, twigs, and pine cones from nature or purchase these types of items from a craft store. Select and buy small plants from a local greenhouse/florist or through online resources. Cover the table top with newspaper before you begin – this is a messy project ! Step Five: Add bark bits here and there, and wet down the contents of the jar thoroughly with a water-filled spray mister, like the one shown above. Let the contents settle for a few minutes and then add your plants. For my native terrarium, I added club moss,(Lycopodium), partridge berry, (Mitchella), and a forest moss called Dicranella. I also scattered tiny pine cones and birch bark in the jar to make the woodsy scene more realistic. Mist your terrarium thoroughly after planting and cover with the glass lid. Check your plants over the next few days and water with your mister if they seem dry. You are finished ! 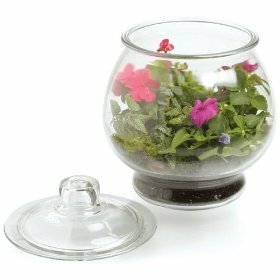 Terrariums need very little maintenance. They are the perfect project for new indoor-gardeners. All you need to do is check on them once a month or so, and add water if necessary. 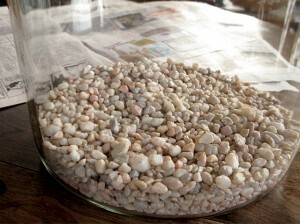 Once terrariums are established, they can go months without any attention at all. 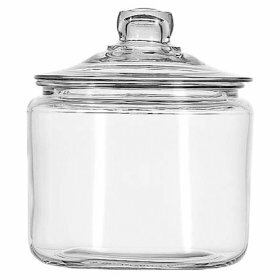 Humidity and condensation inside the jar will generally keep things alive and well. 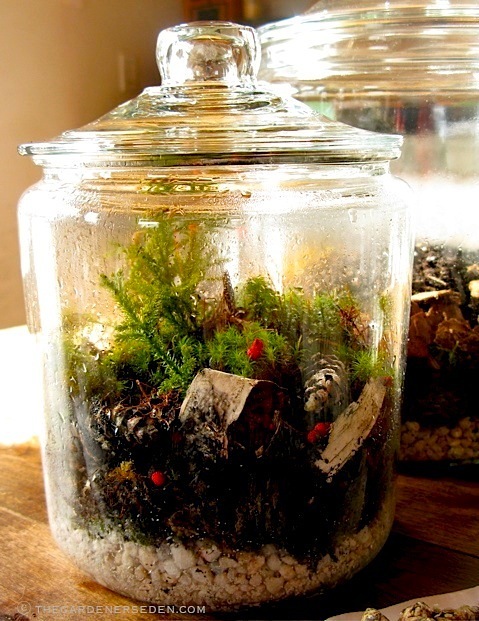 Apothecary jars make lovely terrariums. They are available in many sizes. You can seek them out in antique shops or buy them new. Find more sophisticated and advanced terrarium ideas on the Indoor Eden page at left. Taking a Social Media break? Follow my blog with Bloglovin & never miss a post! Photography copyright Michaela Harlow at The Gardener’s Eden, all rights reserved. All content on this site, (with noted exceptions), is the property of The Gardener’s Eden and may not be used, reproduced or reposted elsewhere without written consent. Do you enjoy visiting The Gardener’s Eden? 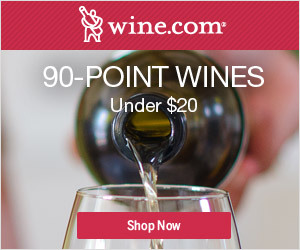 You can help support this site by shopping through the affiliate-links here. At no additional cost to you, a small commission will be paid The Gardener’s Eden, to help with site maintenance and web hosting costs. Thank you! 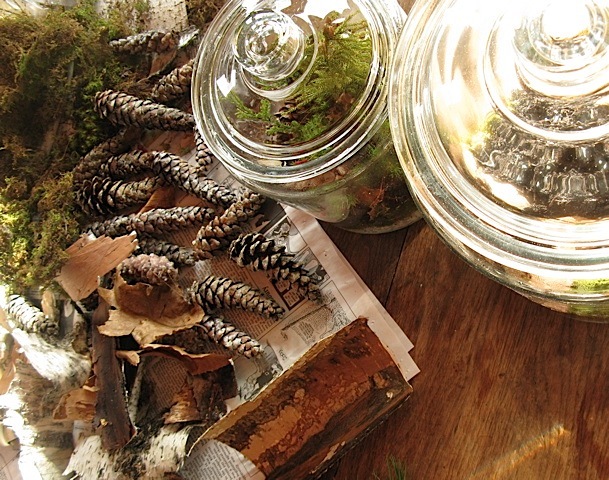 You are currently browsing entries tagged with Terrarium Gift Making at The Gardener's Eden.